The letters of Sergeant Major Marion Hill fitzpatrick, soldier in the 45th Georgia Regiment in the Army of Northern Virginia, have been around for two decades in a private family printing, but are now published for the first time complete with annotations. 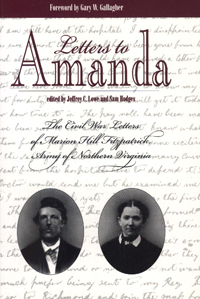 Fitzpatrick wrote his wife Amanda over one hundred letters, frequently describing both the horror of combat and the deplorable conditions o hospitals. Fighting the corps of A. P. Hill, Fitzpatrick, an extremely literate individual, reveals his loyalty for the Confederacy and most of all to his family. His letters reveal a man who longed to be home with his beloved wife and their newborn son. These letters testify to the humanity, courage, and dedication of the civil war soldier.